Simple Wash and Fold Services in Baton Rouge or Self-Service Machines. It’s your choice. 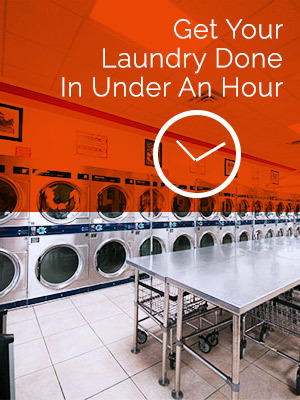 24/7 Coin Laundry offers services for your every laundry need. Whether you are a walk-in customer stopping by to do your laundry, or a commercial business wanting our wash-and-fold service, we are here and ready to help. Our modern, easy-to-use washers and dryers stand ready for you and your laundry. With our self-service machines, you can drop in anytime between 6 a.m. and midnight to complete a load of laundry in less than an hour. Our Laundromat has washers and dryers in varying sizes so you can wash and dry any sized load. To go with our self-service option, our continuously cleaned Laundromat features carts and folding tables for your use, and plenty of seating. For your convenience, we also have bill and quarter change machines and a soap dispenser for our customers. A popular service at 24/7 Coin Laundry is our wash and fold service. It’s the fastest and most convenient service we offer to our customers and can be completed with only four minutes of your time. Take the first two minutes to drop off your laundry to one of our attendants and the last two minutes to pick it up, already clean and neatly folded.